The restaurant chain jumped after last year's U.S. presidential election. Here's why. Image source: The Cheesecake Factory, Inc.
Shares of The Cheesecake Factory (NASDAQ:CAKE) jumped 32.8% in 2016, according to data provided by S&P Global Market Intelligence, primarily thanks to optimism surrounding the results of the U.S. presidential election. For one, as fellow Fool Sean Williams pointed out in November, a significant part of Trump's economic plan involves reducing and simplifying individual income taxes. As such, it seems likely that casual dining chains like The Cheesecake Factory will stand to benefit from any resulting additional discretionary income households might gain. We should also note that Trump spent a significant amount of time during his early campaign suggesting he was largely opposed to minimum wage hikes. And though he softened that stance in the months immediately before the election, even then he expressed a desire to leave any hikes to the minimum wage up to each individual state rather than regulating them through a wider-reaching federal mandate. Moreover, Trump has nominated Andy Puzder -- a longtime fast-food executive and opponent of minimum wage increases -- to be his Secretary of Labor. And keeping minimum wages in check allows more of each dollar to fall to casual dining chains' bottom lines. Investors will need to wait until next month's fiscal fourth-quarter 2016 report to receive more specific color on the company's forward expectations. But for now, the changing political landscape appears to be largely in favor of restaurants like The Cheesecake Factory. 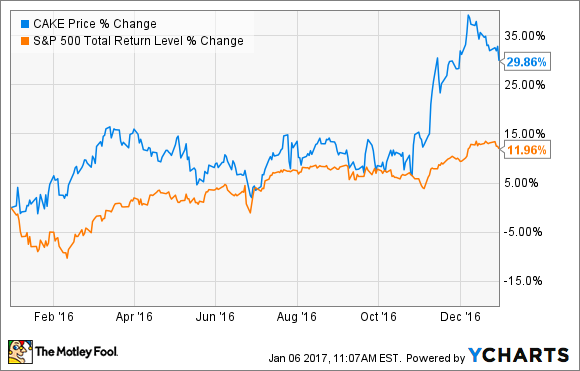 So, it's no surprise Cheesecake Factory shares popped to end 2016.